You might enjoy mobile gaming on your iPad and iPhone, but perhaps you long for something a bit…meatier. 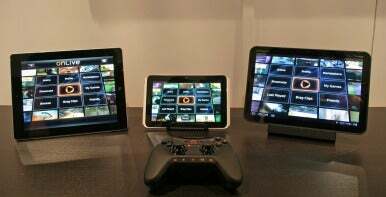 Online gaming service OnLive wants to feed that need, and it’s doing so by launching versions of its client software for tablets and smartphones. The games are no slouches either. OnLive touts the availability of recent high-profile titles like Batman: Arkham City, Assassins Creed: Revelations, and L.A. Noire. The latter is even one of 25 titles that OnLive says has been reworked to take advantage of the touch controls of mobile platforms. Of course, not all games adapt well to touchscreen controls. That’s why OnLive is also offering its $50 Universal OnLive Wireless Controller, which works with PCs and Macs via its included USB wireless adapter or Bluetooth, and works via many tablets and smartphones wirelessly. (OnLive director of communications Brian Jaquet would not confirm in an email whether the controller works with iOS devices, but writing in Time, Harry McCracken says that it works with the iPad via Bluetooth.) According to OnLive, the controller works with almost all of the games the service offers. None of this comes free, but OnLive currently offers several ways to get access to games. You can pay for some titles, which runs close to what you would pay for them from other sources; other games are available to rent for three or five days apiece; or you can opt for the company’s $10 per month PlayPack Bundle, which gives unlimited access to more than 100 titles along with a 30-percent discount on rentals and purchases. While OnLive’s client for Android devices is available now, Jaquet told Macworld that the company “can’t predict when the OnLive iPad app will be officially released.” And just for downloading the OnLive app, you’ll snag yourself a free copy of Lego Batman: The Videogame. According to OnLive’s website, the company’s universal wireless controller will be available beginning on December 9.